The look of the hotel will 'reflect the natural landscape of the quarry'. Not too long ago, pictures of a new international airport in Beijing took over the Internet for being 'incredible' and designed with a 'space age influence'. And now, yet another marvelous construction in China is making the online world swoon. Shanghai will soon have a "Deep Pit Hotel" that is being constructed in what used to be a quarry. 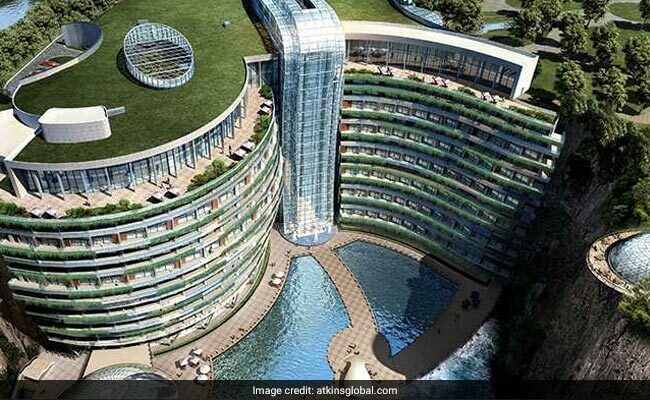 The hotel will have only two stories above the ground - 17 stories will be underground and two will actually be under water, reports People's Daily, China. The pictures of the construction and what they're aiming to build will leave you thoroughly impressed. The 100-meter-deep quarry is located in Songjiang district, not far from Shanghai city. According to Shanghaiist, Atkins, a British design and engineering firm, won the rights to design the hotel. The construction of the hotel began in November 2013. While the pictures of the massive construction look awe-inspiring enough, the final look they are aiming for seems even more stunning. According to Atkins, the look of the hotel will 'reflect the natural landscape of the quarry'. The hotel will have 383 rooms, a green roof, underwater rooms and a waterfall on top of the quarry all the way to the pool at the bottom. The hotel will also feature a glass waterfall-like design in the centre of the building. Wouldn't you want to stay at this hotel at least once? Tell us what you think about it in the comments section below.